Hope you all survived the blizzard of 2015! I was lucky enough to work from home for the first time in a long time which meant a homemade, non-leftover hot lunch! 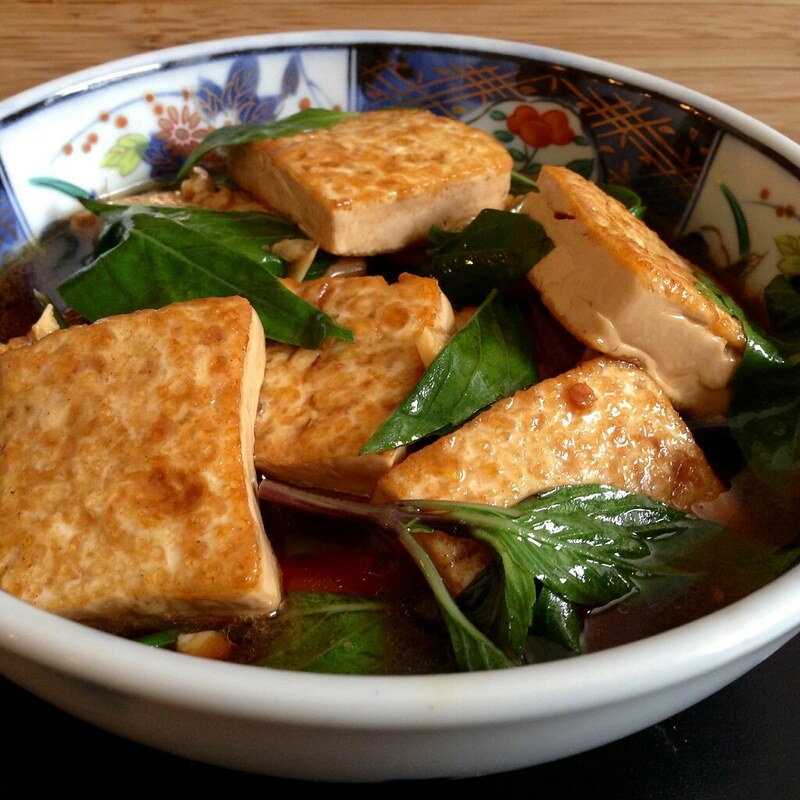 I wanted to try to make a traditional Taiwanese dish called san bei ji but with tofu instead of chicken. San bei translates to "three cup" (ji means chicken), which describes the three main ingredients in the sauce: equal amounts of sesame oil, soy sauce, and cooking wine. I followed this recipe, but since I didn't have a clay pot, I just used a medium shallow pan, which also meant this was a one pot dish. If you don't have rock sugar, you can probably substitute raw sugar, or in a pinch, plain white sugar. If you can believe it, this is my first time pan-frying tofu without a coating, and I really liked how it turned out! The inside is still soft and custardy while the outside is just a little firmer. Best of all, it keeps this texture while braising in the san bei sauce and gains a whole boatload of flavor at the same time. 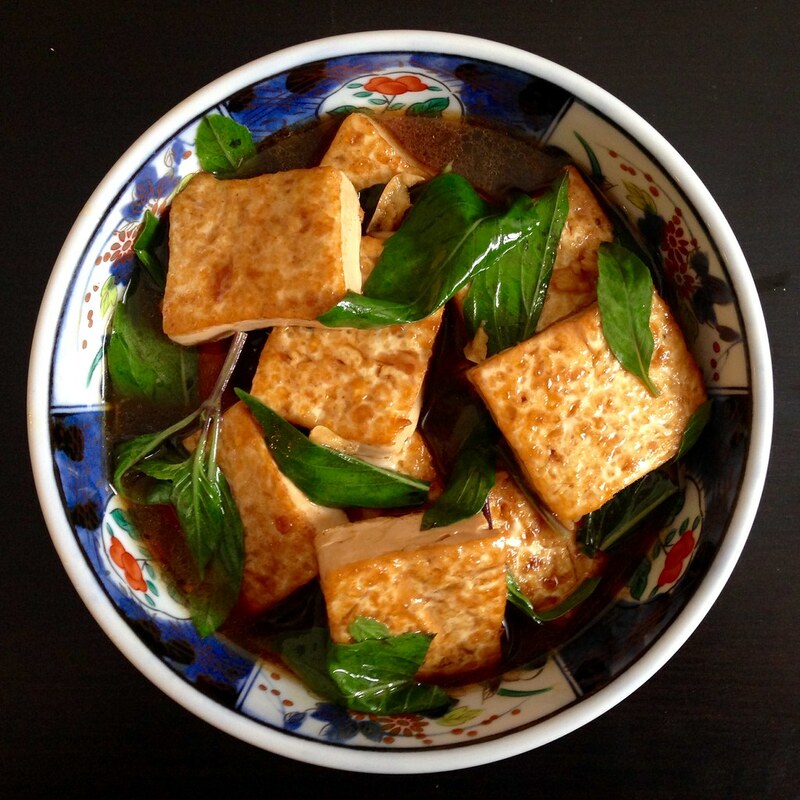 Drain the tofu and pat dry with paper towels. Carefully slice into thick slices. Heat a medium pan on medium high and add the vegetable oil. 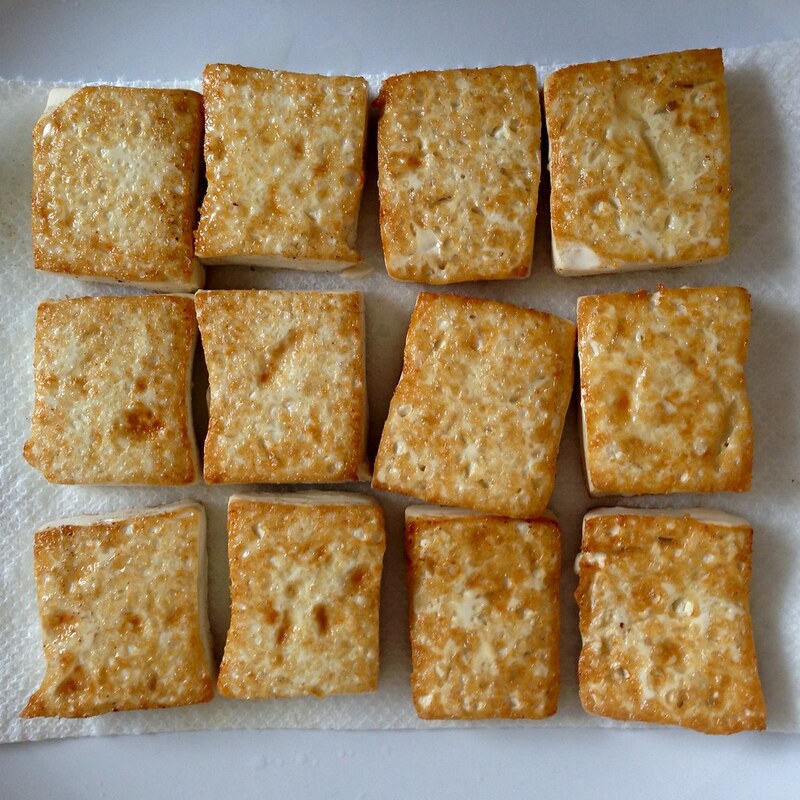 Pan fry the tofu slices for several minutes on each side until golden brown. Remove to a paper towel-lined plate and let drain. Remove any excess oil in the pan and then add the sesame oil. Stir fry the ginger and garlic over low heat until fragrant. Add the soy sauce, cooking wine, rock sugar, water, and the tofu slices. Bring to a boil and then reduce the heat, simmering for about 7 minutes. Mix the cornstarch with a tablespoon of water and add to the pan. Bring the sauce to a boil again and stir until thickened. Add the Thai basil leaves and cook for another minute until wilted. Serve with white rice. When I make this dish again, I'll probably reduce the amount of water or increase the amount of tofu because it made a lot more sauce than I really needed. 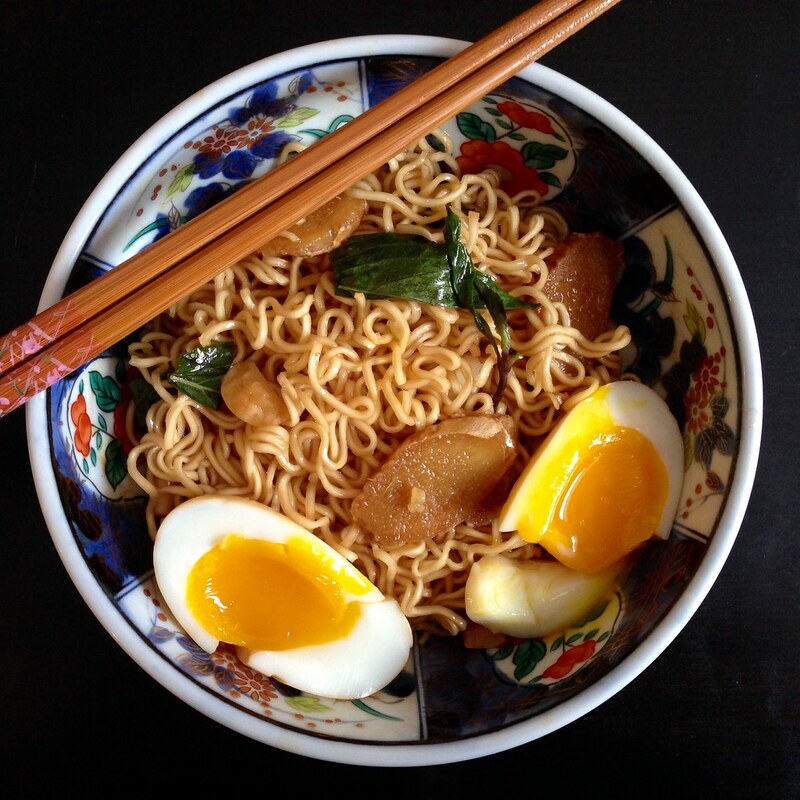 But since the sauce was so yummy, I decided not to waste it and experimented by adding it to some ramen noodles and a soft-cooked egg. The result was so much better than I could have hoped for, and I will most definitely be experimenting with san bei ramen again! Recently my friends (and even my mom!) have been telling me that the recipes I've been posting have become too complicated. So here's one of the simplest recipes I know; it was actually one of the first things I learned how to make when I started cooking in college. The recipe comes from my friend, Jaleen, who, if I recall correctly, got it from her family. You probably have all the main ingredients in your pantry already: peanut butter, pasta, soy sauce, vinegar, sesame oil, and sugar. 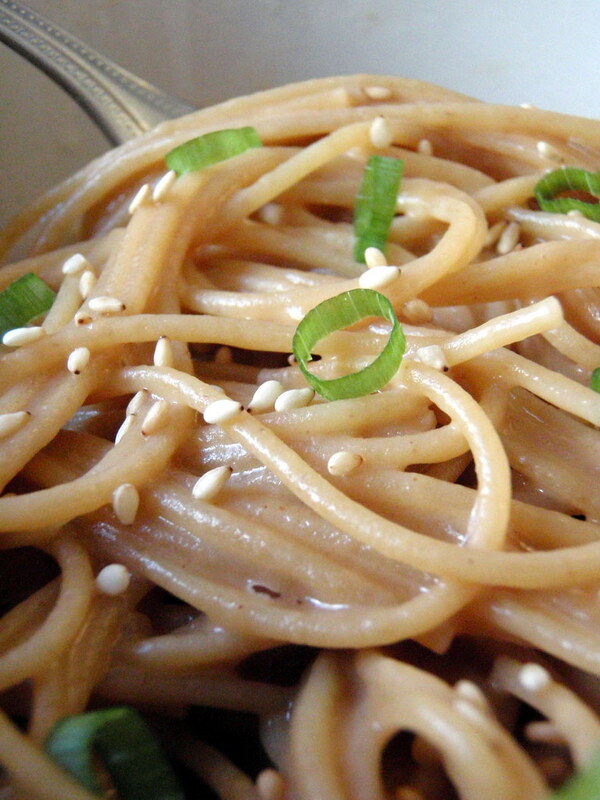 You literally don't even need measuring spoons for this; the sauce is made up of 3 parts peanut butter, 3 parts soy sauce, 1 part vinegar, 1 part sesame oil, and a pinch of sugar. If I'm just making enough for myself, I use a small spoon, and if I want to make more than one serving, I'll grab a large spoon to measure. I prefer to use smooth peanut butter, but this works just as well with chunky. For the vinegar, rice wine vinegar is suggested, but regular white vinegar or cider vinegar would do in a pinch. Depending on what else you have on hand, you can add a plethora of toppings: toasted sesame seeds, sliced almonds, chopped scallions, shredded chicken, baked tofu, and shredded cucumbers are just a few ideas. You can serve this dish cold or at room temperature so it's easily packable for lunch, picnic, or potluck. See, I told you it was easy! The hardest part about this recipe might be trying to mix the peanut butter into the other liquids without splashing, but if you stir carefully and long enough, you'll end up with a smooth, homogenous peanut sauce. 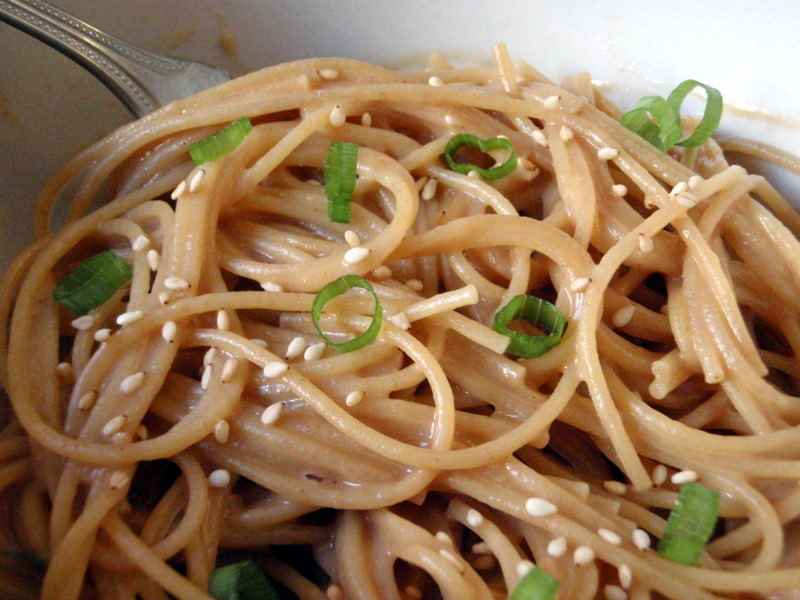 Mix the peanut butter, soy sauce, sesame oil, vinegar, and sugar together until the sauce becomes smooth and creamy. Toss with the cooked noodles, adding some of the pasta water if you want to thin out the sauce. Serve with toasted sesame seeds, sliced almonds, chopped scallions, shredded chicken, baked tofu, and/or shredded cucumbers if you like. I live in one of those rare regions of the United States that isn't big on chain restaurants, other than Dunkin' Donuts. To explain how drastic it is, I'm pretty sure there isn't a single McDonalds located in the city I live in (population > 50,000)! I don't really mind that much, but it means that going to restaurants like Olive Garden are actually a special occurrence to me, especially when I find myself in a town like Morgantown, West Virginia on a business trip and have no clue where to eat (true story). 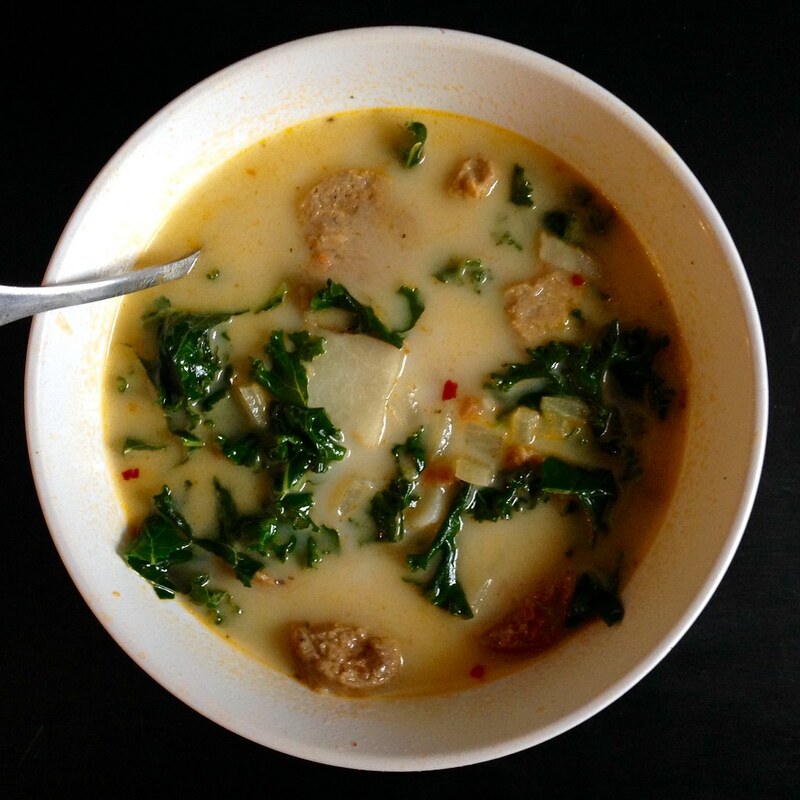 I am easily satisfied with their endless soup, salad, and breadsticks and always get the Zuppa Toscana. I have no idea if it's an authentic soup to Tuscany, but I don't care. It's frickin' amazing. Now that I'm back home, I looked for copycat recipes on-line, and there are like hundreds of them, even vegetarian and vegan ones! I ended up just following the first hit that came up except I used vegan Italian "sausage" and whole milk instead of the heavy cream. It's a bit healthier, but definitely not as rich as what you'd get with the cream. I also added more kale and potatoes since I had a bunch of kale to use up from my Boston Organics box, and I love me my potatoes. Since the chicken or vegetable broth you use will be one of the main flavor components in the soup, make sure you use a really good one. Better yet, make your own! Heat the olive oil over medium in a large pot and add the sausage and chopped onions. Stir occasionally until the sausage is browned (but not the onions). Add the minced garlic and cook for another minute. Add the broth and water and bring the pot to a boil. Add the torn kale leaves and milk and stir. Cook for another 5 minutes until the kale has wilted. 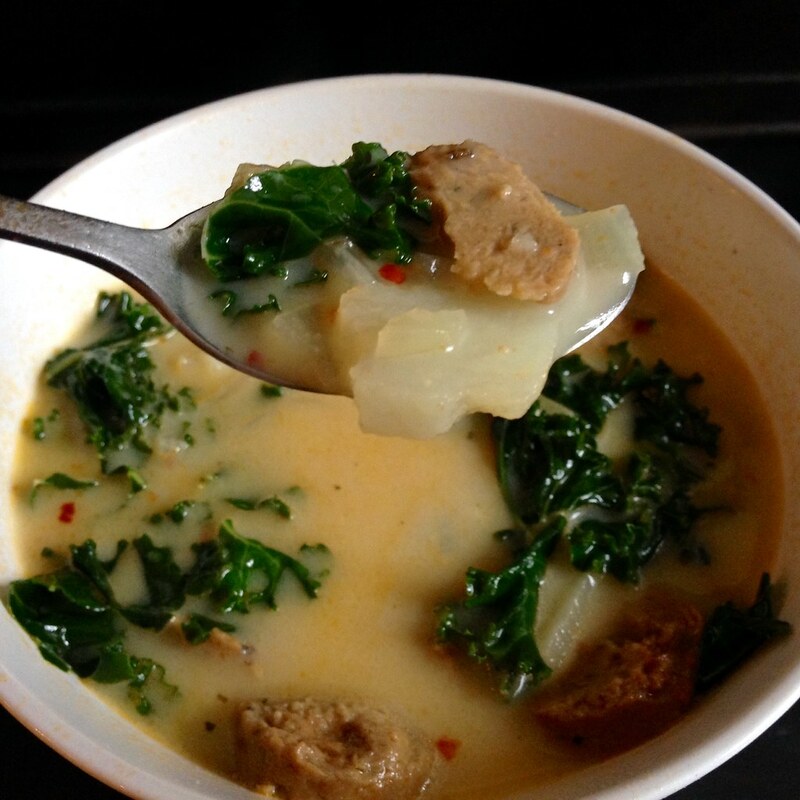 If you like, smoosh some of the potatoes into the soup to make it creamier and slightly thicker. Serve hot. 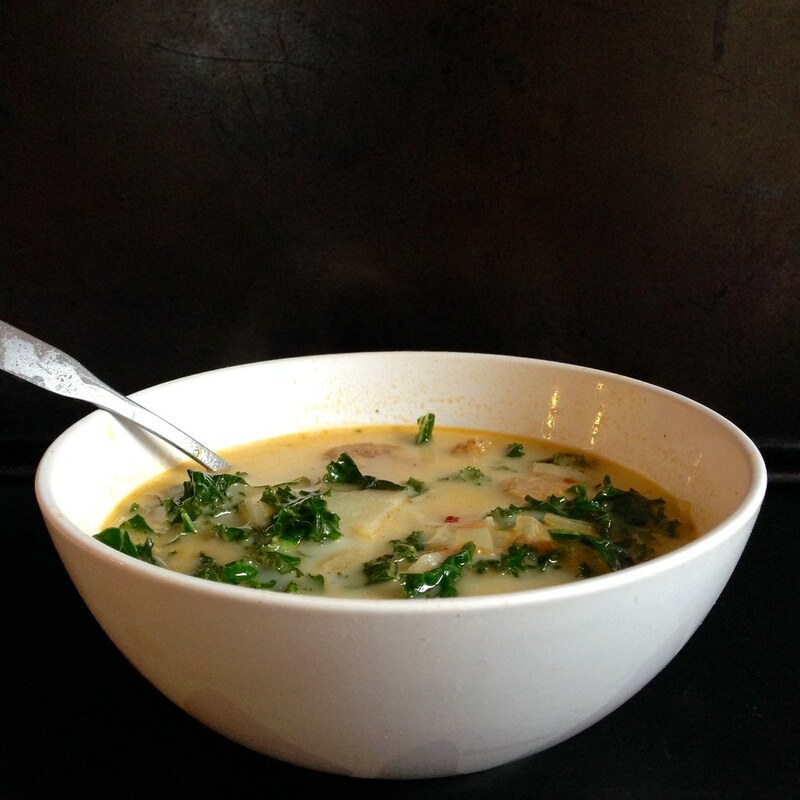 Note: Because of the addition of dairy and potatoes in this soup, it does not freeze well. It does, however, taste better the next day after sitting in the fridge!